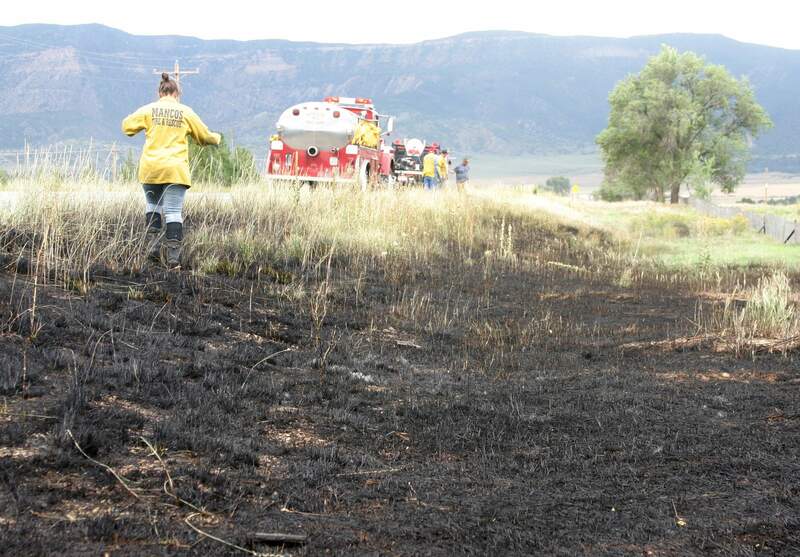 Taylor Goff, a volunteer with the Mancos Fire Protection District, looks for hot spots last year after putting out a brush fire along U.S. Highway 160 west of Mancos. The cause of the fire was unknown, but a cigarette thrown from a passing vehicle was suspected. The summer fire season has arrived early this year, and the Colorado State Patrol in Southwest Colorado says it has zero tolerance for behaviors that could result in wildfires. According to an April 19 snow and precipitation update report from the Natural Resources Conservation Service, the snow-water equivalent is at 33 percent of the 1981-2010 median and the water year-to-date precipitation is 46 percent of the average for the Animas, San Miguel, Dolores and San Juan river basins. CSP reminds Durango-area residents of last summer when the Lightner Creek Fire started at the end of June northwest of Durango. The wildfire consumed 412 acres before it was contained, and forced 170 residents to evacuate, with 173 firefighting responders called to the scene. Leaving, neglecting, disposing or throwing burning material from vehicles, such as cigarettes or cigars – lit or ashed.Failing to remove lit or burning matter on roads.Unlawful possession, sale or use of fireworks.Even intentionally-ignited, seemingly well-contained fires, such as campfires in a ring, can easily burn out of control. Residents and visitors must adhere to fire bans whenever and wherever they are issued, according to the CSP. Low fuel moisture levels, moderate-to-high winds, high temperatures and terrain that varies in elevation can contribute to out-of-control fires. Fires that damage public lands or private property, or cause injury or death, carry a range of arson charges. Charges can apply even if a fire is unintentionally started or intentionally started but not maintained in a reasonably cautious manner. Fail to yield the right-of-way to an emergency vehicle.Follow too closely behind fire apparatus.Drive a vehicle over fire hoses.Park in front of a fire hydrant.CSP asks people to be aware of their actions this summer while driving, camping and enjoying the summer. Drivers should keep in mind where vehicles are parked; hot exhaust components can easily ignite brush or dry grass and the car itself. For information about fire bans and National Forest Service burn permits, visit www.fs.fed.us/visit/know-before-you-go/fire.